Maddalena has spent the last twenty years working in Mexico with indigenous artisans, researching traditional weaving and dyeing techniques. She loves to play with the dye process. Plants, bark, flowers and insects enable her to create an unlimited spectrum of colors, hues and saturations. She has vast experience working all over Mexico with indigenous weavers, sharing her knowledge of natural dyes and working as a design consultant on behalf of foundations, NGOs, and government projects. Deeply committed to the people she works with, Maddalena has lived many years in the small communities around San Cristóbal de las Casas, Chiapas. She co-founded several cooperatives in the region, and she is dedicated to empowering women and supporting the revitalization of ancient techniques that are in danger of disappearing. In addition to her product design, Maddalena is an accomplished gallery artist and has had numerous exhibitions around the world. Her work has been exhibited at Museo Franz Mayer, Mexico City, Mexico, Museo Textil de Oaxaca, Mexico, Cer Modern, Ankara, Turkey, The Fashion and Textile Museum, London UK. She was invited to exhibit her work by the most important fiber art events such The International Triennial of Tapestry, Lodz, Poland, and the Hangzhou Triennal of Fiber Art, China. In this work, she expresses her special alchemy by creating complex and subtle color combinations along with incredible textures. 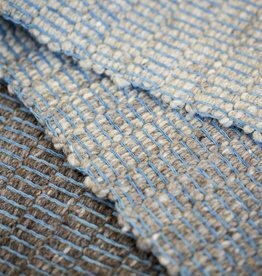 Maddalena’s elegant designs weave one thread that connects the traditional and the contemporary.